By the time you read this, you’ll probably have Christmas all wrapped up (not sure we’ll be able to say the same at Robinson HQ, but that’s another story). Either way, now is the time when magazines promise a New You for the New Year. But I bet no one else can offer such a fun way to achieve it – yes, that’s right, a cruise. Turn to page 22 to find out how to get yourself shipshape at sea. The coming year looks set to be a fabulously exciting one for travellers (see page 111 for cruise expert Edwina Lonsdale’s predictions), so why not book that holiday of a lifetime? 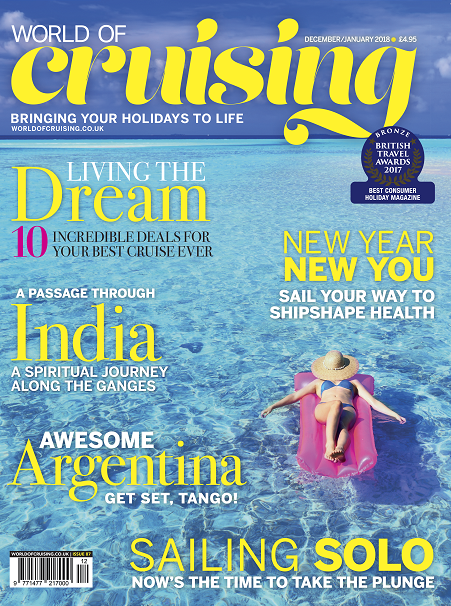 Starting on page 56, we’ve picked the dreamiest destinations, and found some amazing deals with specialist cruise agents to help you get there. If lazing on a palm-fringed beach is your ideal, the Caribbean is back in business (see page 109) – while if you’re yearning to explore, we’ve found an incredible Indian river cruise (page 72). Finally, we’re all glowing here in the WOC office, following our Bronze Award in the prestigious 2017 British Travel Awards. I’d like to say a big thank you to everyone who voted for us – and to wish you all a very happy Christmas and a globe-trotting New Year.